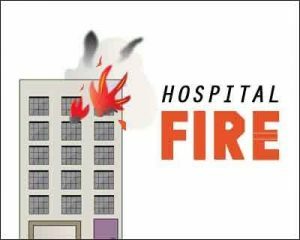 Bilaspur: Three employees of the city-based Chhattisgarh Institute of Medical Sciences (CIMS) fainted due to smoke inhalation after a portion of the hospital caught fire on Tuesday, officials said. Following the blaze, 40 children undergoing treatment in the paediatric ward of the hospital were shifted elsewhere. According to officials, the fire was caused due to a short circuit. “The blaze started at the power control unit located under the paediatric ward in the hospital. All the children were moved to safety, but three employees who were involved in the fire-fighting operation fainted due to suffocation. They were admitted to the same hospital for treatment,” officials said. The employees were identified as Iqbal, Rudra and Upendra, they said. Meanwhile, the fire brigade was alerted and the flames were doused within 40 minutes. While some of the children were admitted to the district hospital, around 10 kids were shifted to a private hospital, they said. Superintendent of SIMS, Dr Bhanupratap, said a newborn baby died on Tuesday during treatment, but the incident of fire has nothing to do with it. “The baby had been shifted to SIMS from a private hospital in a critical condition on Monday and died during treatment,” he said.